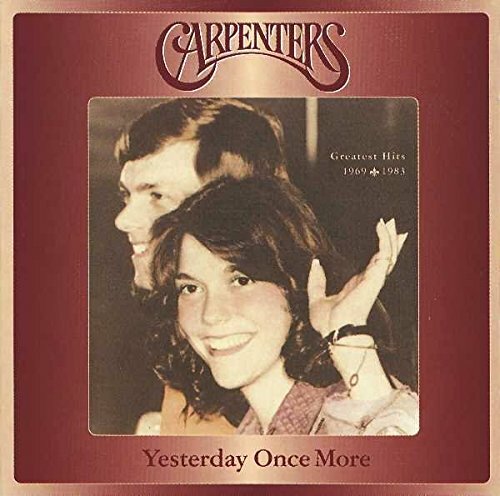 Yesterday Once More: Greatest Hits 1969-1983 by Carpenters, The at WA Tunes. MPN: CD551000. Hurry! Limited time offer. Offer valid only while supplies last. Out of print in the U.S.! Digitally remastered two CD compilation from the '70s Soft Rock hitmakers with different artwork than the long-deleted U.S.
Out of print in the U.S.! Digitally remastered two CD compilation from the '70s Soft Rock hitmakers with different artwork than the long-deleted U.S. version. From the late '60s to the early '80s, nobody created music as lush and beautiful as the Carpenters. They were in a class by themselves with Karen's haunting and lovely voice and Richard's expert arrangements. Unlike most of their compilations, Yesterday Once More creates different moods by featuring the tracks in non-chronological order. Disc One mixes Soft Pop and Soft Rock ('Superstar', 'I Won't Last a Day Without You' and their excellent cover of Klaatu's 'Calling Occupants of Interplanetary Craft') while Disc Two features a more mellow, ballad heavy mixture of audio wonder ('We've Only Just Begun', 'This Masquerade' and the all-time classic '(They Long to Be) Close to You'). a truly fantastic collection by the duo and a perfect selection for those wanting to relive the magic of the Carpenters. 27 tracks. Universal. If you have any questions about this product by Carpenters, The, contact us by completing and submitting the form below. If you are looking for a specif part number, please include it with your message.